Give your skin a rejuvenating and refreshed feel with the goodness of activated charcoal and a boost of coffee with the Man Arden Gift Box. Man Arden Charcoal Peel Off Mask (100ml): For every skin type! This incredible charcoal peel off mask instantly brightens and softens your skin to reveal a more agelessly, luminous look. It will make your skin look healthier and hydrated. The perfect step to add to your skin routine. An easy solution to remove skin impurities, blemishes, blackheads and pimples. When creating this mask, a process to ""Activate"" the bamboo was used. This process turns the bamboo to ashes and is injected to the mask using steam. The activated bamboo helps to pull out all skin impurities leaving your skin will more toned and smoother, giving you a glowing new look. Man Arden De Tan face Scrub (100ml): The de-tan brightening face scrub helps improve skin tone, texture and clarity to reveal brighter, more radiant skin. It is a collection of facial skin care ingredients uniquely formulated to target all 7 factors of face care. For men who spend a lot of time outdoor or sweat it out at the gym this is a must. While a face wash cleans your face, the scrub penetrates the pores of your skin and removes the dead skin. Making the skin healthier. 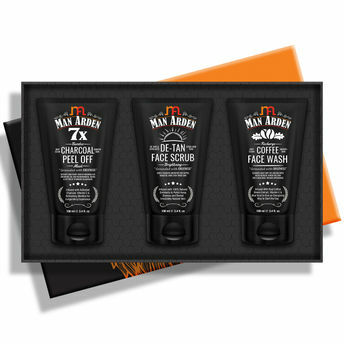 Man Arden Coffee Face Wash (100ml): Feel energized, look refreshed every time you wash your face. Man Arden Recharge Coffee Face Wash leaves your tough skin squeaky clean after harsh hours in the open. Blended with coffee bean extract, vitamin E, soothing aloe vera gel and numerous other most efficacious natural ingredients it becomes the one product you need for a bright, clean and confident face.